Preview Day Three (Qualification): Attention turns to preliminary round action, who will qualify? Unseeded players will return for a third day of qualification action in Stockholm with main draw places up for grabs on Wednesday 15th November. 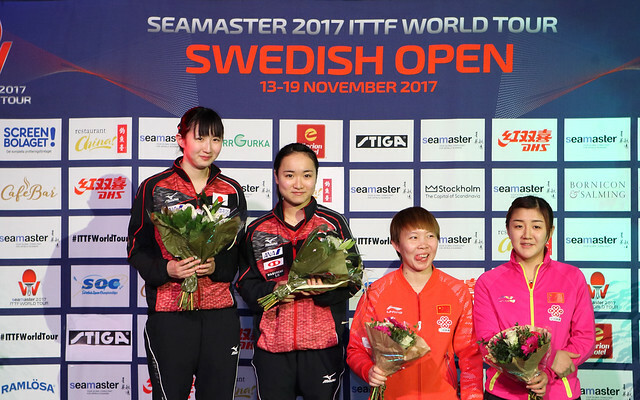 Here are some of the key battles in the race to reach the Seamaster 2017 ITTF World Tour Swedish Open. With the Seamaster 2017 ITTF World Tour Grand Finals to be hosted in Astana next month, Kazakhstan’s Kirill Gerassimenko will be hoping to be at his best for the end of season event and a spot in the Men’s Singles main draw at the Swedish Open would provide an ideal confidence boost for the 20-year-old. Two victories on the third day of qualifying in Stockholm and Kirill Gerassimenko will achieve that goal but the young Kazakhstan star will have to be at his very best if he is to successfully negotiate his tie against Poland’s Jakub Dyjas. The winner will meet the host nation’s Pär Gerell in the second preliminary round. Wang Yang will also feature in the opening round of preliminary action as the Slovak Republic representative attempts to earn a place in the main event which officially commences on Thursday 16th November. Providing the opposition in the penultimate stage of qualification tournament is India’s Soumyajit Ghosh, who will be aiming to achieve somewhat of an upset when he goes head-to-head with Wang Yang. The reward for the victor of the tie is a play-off against Korea Republic’s Jeong Sangeun to reach the Round of 32. Miyu Kato is still in with an outside chance of qualifying for the Women’s Singles competition at next month’s ITTF World Tour Grand Finals, but will require a strong outing in Stockholm if she is to keep the dream alive. Reaching the main draw is a must for the Japanese teenager, but will she deliver the goods when she does battle with Slovak competitor Barbora Balazova? Accompanying Miyu Kato in the preliminary round are four other Japanese contestants including Mitsuho Kimura, who heads into her encounter against world no.37 Yu Mengyu off the back of a stunning group stage campaign which resulted in early eliminations for Canada’s Zhang Mo and Egypt’s Dina Meshref. The Under 21 competitions resume with semi-finals action to start the day before both events draw to a close in the afternoon session of play. Doubles preliminary qualification matches will also feature.